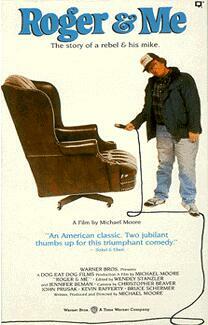 I put in this DVD expecting to like it, as I had liked Moore’s Bowling for Columbine. But in Roger and Me Moore’s stabs and jabs at GM seemed hollow and without too much basis. Regardless of politics, the movie was rather dull. It had some memorable moments, but mostly they were moments that made me cringe. Watching a lady beat a rabbit to death with a 2” metal pipe just isn’t my idea of fun. Though it was interesting (and creepy) that she acted so normal just before the slaughter, holding her rabbit, petting it, and cooing to it like it was her most beloved pet. Now I understand that it was supposed to be disturbing, but it felt disturbing without purpose. Why was this woman killing the rabbit? Because she was poor? Ok, but why was she poor? The implication was that it had something to do with GM closing the Flint, Michigan plant. But that argument was never fleshed out, let alone even stated. There was too much footage of families being evicted from their homes. These scenes felt particularly invasive, especially because, again, Moore never directly connects any of the evictions to GM’s actions. The final “interview” at the end was a let down—Moore gets in only 3 or 4 questions and they are answered in a completely evasive way. Maybe that’s the point, that the head of GM is a slimy weasel, but he seemed no more of a slimy weasel than any other corporate leader or politician and so it lacked punch. There were some interesting sections of this movie. I found the part about the public relations attempt to drum up tourist interest for Flint, Michigan to be an impressive boondoggle, and adequately covered by Moore. But there weren’t enough of these good parts to over look all the bad in this movie. It’s hard for me to see why this movie got so much critical acclaim—It was just boring.